Every thing is an image. The Internet, that luminous machine, makes this so. Today’s images are casual; they are detachable; they are found objects; they are anonymous. This essay is about one image: Claire Greenshaw’s Autobiography. This artwork and its documentation are inseparable, until I view it in person, which, given the odds of fate, may be soon or may be never. I am tasked with a writing experiment: to interpret artwork seen only via an artist’s website. I chose to write about Greenshaw because her artwork, as viewed online, exemplifies, for me, art that is a symptom of the Internet. Greenshaw’s studio practice seems to sprout directly from this web. Who is Claire Greenshaw? I do not know. I have not scheduled a studio visit; I have not emailed any questions. I have made a rule: Autobiography will tell me everything I need to know. Will the artist like this game? I do not know. What I do know is that images on the Internet are intrinsically coherent and inherently whole. They have to be. A surprising byproduct of the Internet’s freefall velocity and infinite space-time is stillness. Pause. Performances, videos, objects, and post-objects are converted to stills. This is, in part, a consequence of viewers who demand that all art objects be documented and depicted online, making the Internet a repository of readymade images. 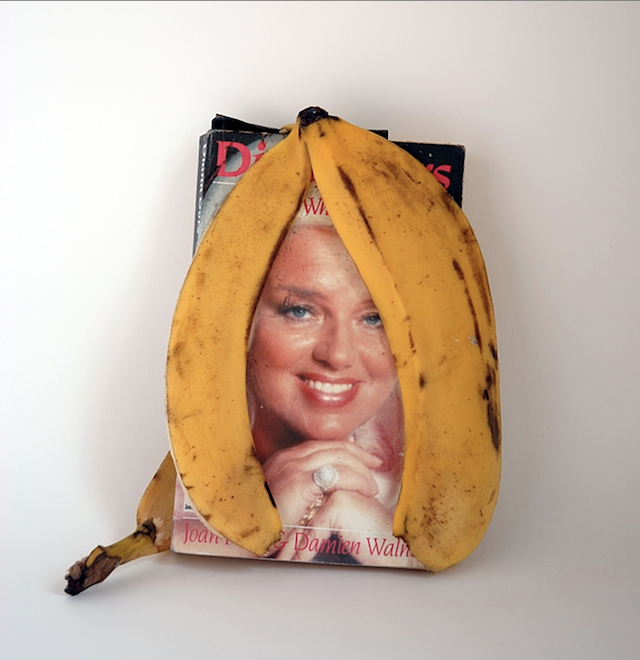 A banana peel draped over a paperback constitutes Greenshaw’s Autobiography. As a sculpture (medium: banana, paperback), Autobiography, now documented, looks perfect as an image; it is a three-dimensional collage. Presumably the sculpture no longer exists as it did on that day in 2010 when it was photographed. The paperback is likely shelved, the peel now mold and dust. (As I write this, I can look out my window and see a banana peel that someone tossed onto the roof of my garage weeks ago, now putrefied. The time-based object does not retain its banana-ness.) But, the documentation of the sculpture survives, as fresh as if it were a Scratch ‘n Sniff. The banana peel is a gag. It is also a memento mori. The paperback is a Diana Dors biography from 1987–my generation may best know the British actress from her appearance in a film still on The Smiths’ Singles album cover. Greenshaw combined the two elements, each image like Clip Art with its own pre-fab signifiers, to make a tragicomic artwork. Here today, gone today. It tiptoes on slapstick. Like images on The Jogging, Autobiography delivers a punch line, however obscure it may be. Documentation of art is a practical task performed in response to an impractical object. Documentation and image-distribution accidentally turns artworks into disposable omens and intuitive icons. Accidents, as a creative strategy, can be very fruitful. Greenshaw’s found culture is a funny thing; it is nature—our nature. Culture is naturally occurring. It slips into your day like a banana peel or a dead actress. Culture is a given. It exists before you, through you, and beyond you. You can even go foraging for culture: in magazines, museums, or mirrors. Like nature, culture comes with its own anxieties: if we don’t grab it, it will disappear forever; it may already be too far gone. Autobiography is made of cultural rubbish, and rubbish is, of course, the mark of life, the residue of being alive, proof that we have a shared language and exist in a shared ecology, however diverse and anonymous. As such, Greenshaw’s artwork is in cahoots with the art strategies of Brad Troemel, Brenna Murphy, Andrew Norman Wilson, and many others. This is the second essay in the series OPP ART CRITICS for the OPPBlog. To read the first essay in the OPP Art Critics Series, "The Child is (Un)dead: Taxidermy Art as Victorian Post-Mortem Photography" by Managing Editor Alicia Eler just click HERE. Look for our next installment on June 11, 2013.